A school competition against racism and xenophobia has been launched by the UN Refugee Agency in Cyprus, the Ombudsman’s office and the European Commission Representation in Cyprus. 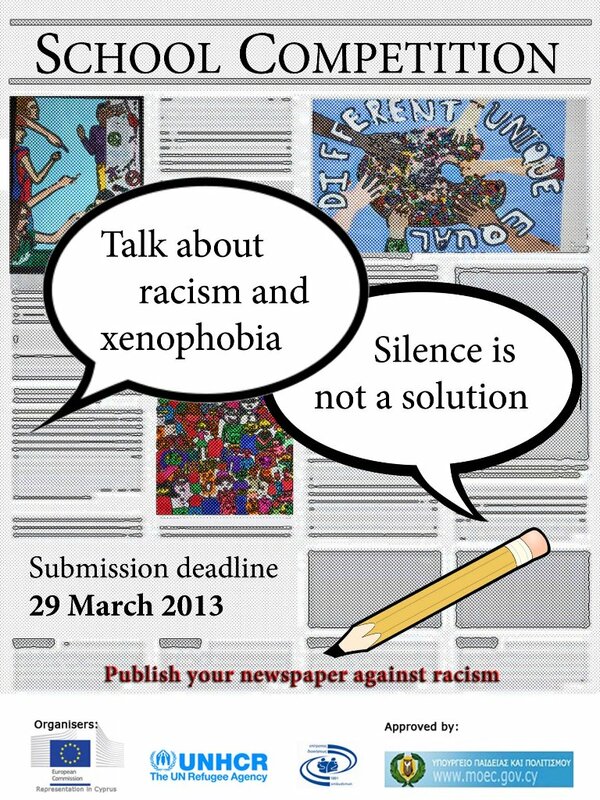 With the slogan “Talk about racism and xenophobia: silence is not a solution”, the competition is looking for the best student newspapers. The competition invites public and private secondary schools to create a newspaper with articles, reportages and researches as well as opinions on asylum and migration, racism and xenophobia. Objective and unbiased coverage of these issues is one of the criteria that will determine the winning newspapers. With regards to the overarching aims of the competition the organisers explain: “We aim at dispelling stereotypes and prejudices against migrants and refugees and to emphasize both the necessity and the benefits that the integration of persons with different backgrounds can yield on the Cypriot society”. Identifying and addressing racism at schools, with reference to tensions with a racist overtone that occasionally takes place at schools, lies also behind the competition: “The effective management of such incidents by the school community strengthens the resistance of students, and future citizens, against racism; it also responds to the needs of the multicultural society and wider diversity that characterizes Cypriot schools and the society at large,” the proposal reads. An interview with a refugee or migrant or with an organization that advocates for their rights; an anonymous research within the schools to detect potential racist incidents; the coverage of an event – organised by the students – that brings together migrants and locals; are a few of the 15 suggested stories that students can tackle as young reporters. In order to support the students’ efforts, the organisers stand ready to provide sources and educational material on the issues of xenophobia, racism and refugees; and to visit schools to discuss with students on these topics. Six successful newspapers – three from Gymnasiums and three from Lyceums and technical schools – will be selected by an ad hoc committee. School winners will be awarded – at a special ceremony to be announced later – laptops, cameras, video cameras as well as symbolic placards with the inscription “Schools against Racism”. The cost of the awards, including the placards, will be borne by the European Commission Representation. With the aim to enhance a thorough and critical discussion on the competition’s themes, the organisers expect schools to work as a team and submit one group entry to the competition. Based on this rationale, the awards will be placed at the winning schools for the mutual and common benefits of the students. Deadline of the competition is the 29th March 2013. All interested schools must submit their newspapers in an electronic format. Check out the event on Facebook and YouTube! The NGO Support Centre (@ngo_centre) are working with the Association for Historical Dialogue and Research (@AHDRCY) on an open lecture entitled ‘Lands of No Return: population exchange and forced displacement in the 20th century’ next Wednesday 30 January, at 18:00, at the Home for Cooperation, in Nicosia. 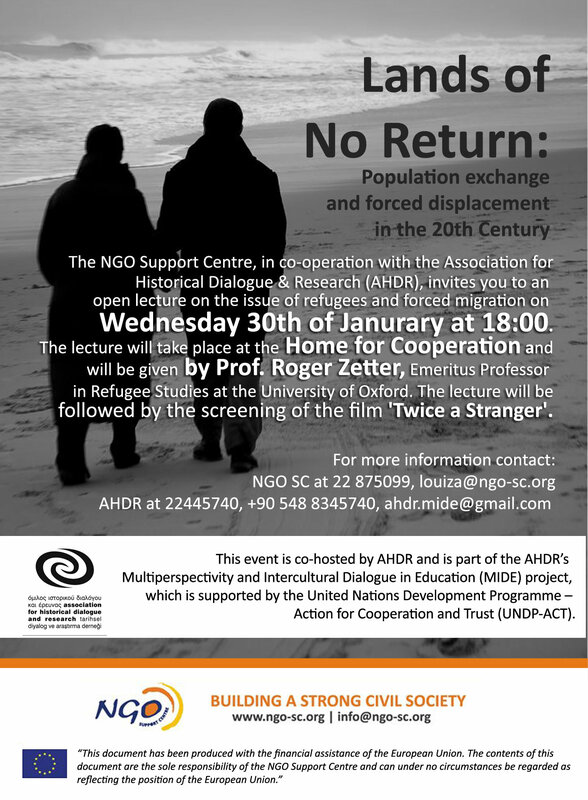 The lecture will be given by Prof Roger Zetter, Emeritus Professor in Refugee Studies, University of Oxford, and will be followed by the screening of the ‘Twice a Stranger’ documentary. As part of a series of events dedicated to development, CCMC member the NGO Support Centre (Twitter ngo_centre) is organising an open discussion on the topic of Feminism and Development. 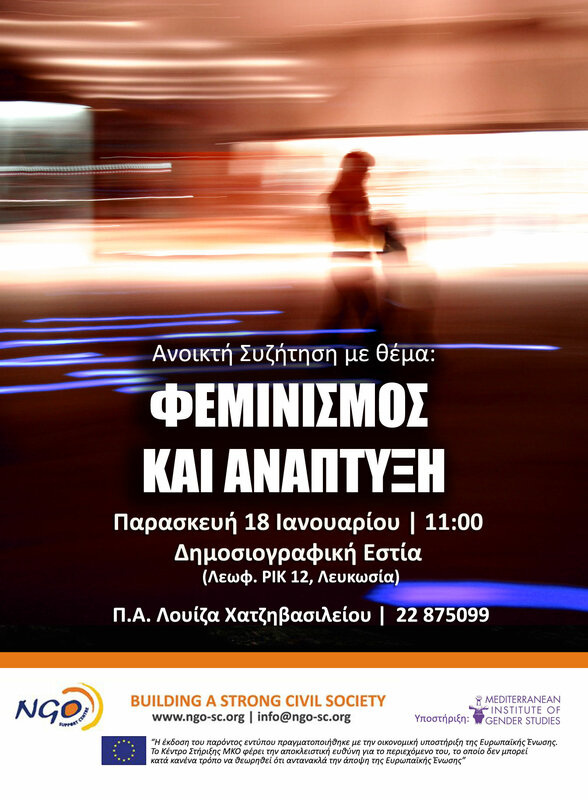 The event will take place on Friday 18 January at 11am at the Greek Cypriot Union of Journalists in Nicosia. All events are organised within the framework of the «Knowledge Makes Change!» project, which aims to raise public awareness in relation to international development and development aid. The discussion is supported by another CCMC member organisation, the Mediterranean Institute for Gender Studies (MIGS) – Twitter @MigsCy. 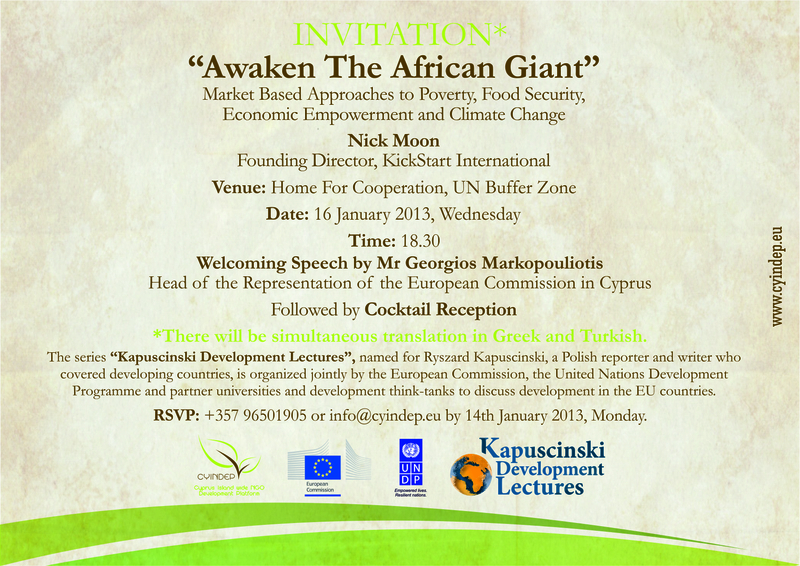 For the second year running, CCMC member the Cyprus Island-Wide NGO Development Platform (CYINDEP) is hosting a Kapuscinski Development Lecture on Wednesday 16th January 2013 at 18:30, at the Home for Cooperation in Nicosia. “Awaken the African Giant” will be the topic of a lecture by Nick Moon, a winner of several awards for bringing together the entrepreneurial spirit of the poor, innovative tools and technologies, and the power of the marketplace, developing a cost effective and sustainable way to help families lift themselves out of poverty. He is a co-founder of KickStart and is based in Nairobi, Kenya. Georgios Markopouliotis, Head of the Representation of the European Commission in Cyprus will offer a welcoming speech on behalf of the organisers, the European Commission and the United Nations Development Programme (UNDP). The event is also supported by the NGO Support Centre. The lectures honour the name of Ryszard Kapuscinski, a Polish journalist and writer, who died in 2007. Kapuscinski, whose books were translated into many languages, was often named the “Third World Chronicler” or the “Voice of the Poor” for his famous reportages and books describing developing countries on all continents. Among other books, he was famous for: “The Emperor” on Ethiopia, “Shah of Shahs” about Iran, “The Shadow of the Sun” about Africa, “Another Day of Life” about Angola, and “Imperium” about the Soviet Union. Alternatively you can contact Natasha Apostolidou Efthymiou at natasha.apostolidou@cyindep.eu or by phone +357-99-551699 . Simultaneous translation will be available in Greek and Turkish. 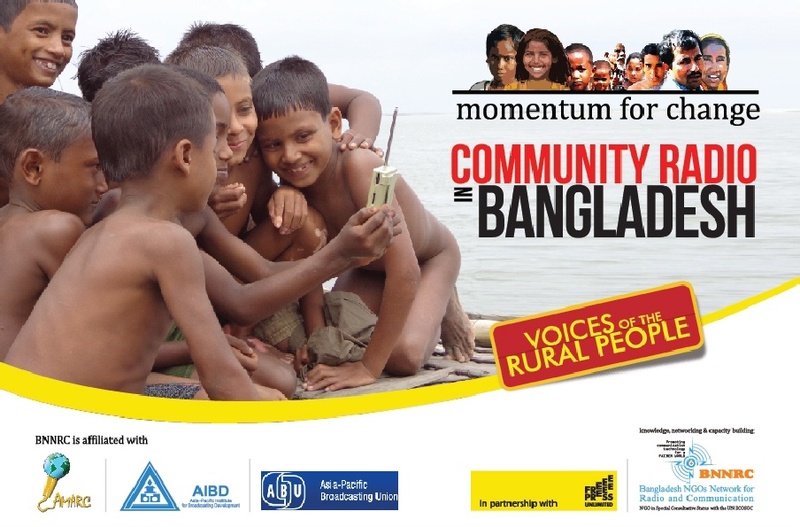 The Bangladesh NGOs Network for Radio and Communication (BNNRC) has launched its latest publication Momentum for Change: Community Radio in Bangladesh – Voice of the Rural People. Momentum for Change celebrates the 14-year struggle to open up the community broadcasting in Bangladesh, giving emphasis on its vital role in giving voice to the voiceless and aiming to help to bridge the information gap for rural Bangladesh. There are currently 14 Community Radio Stations on-air in the country aiming to ensure empowerment and right to information for rural communities. Altogether these stations are broadcasting up to 120 hours of programming per day on information, education, local entertainment and development motivation activities. Around 536 youth & youth-women are now working with those stations throughout the country as rural broadcasters. The work of BRNNC is an inspiration to all Community Media advocates across the globe, and we here at CCMC, are looking forward to learning about success stories from Bangladesh and other countries where Community Media is taking root! It’s not that we’re no longer gonna be making our own productions… It’s just that we thought that it was time we opened up a little and work with your creativity to get the stories and voices that really matter out in the open. Today CCMC lauched Make Media 2012, an opportunity for a wide range of media producers, filmmakers and creative freelancers to connect with CCMC and its mandate of amplifying the voice of all communities of Cyprus. CCMC is welcoming productions realised in a variety of ways including but not limited to Documentary, Animation, Audio Slideshow, Multimedia, Motion Graphics, Narrative/Fiction, Podcasts and Radio. The best productions will be showcased at a CCMC Film Festival sometime next Spring. Given the nature of our work we hope that each entry contributes to greater understanding of the communities of Cyprus, and include the cross-cutting theme of peaceful coexistence and/or reconciliation. 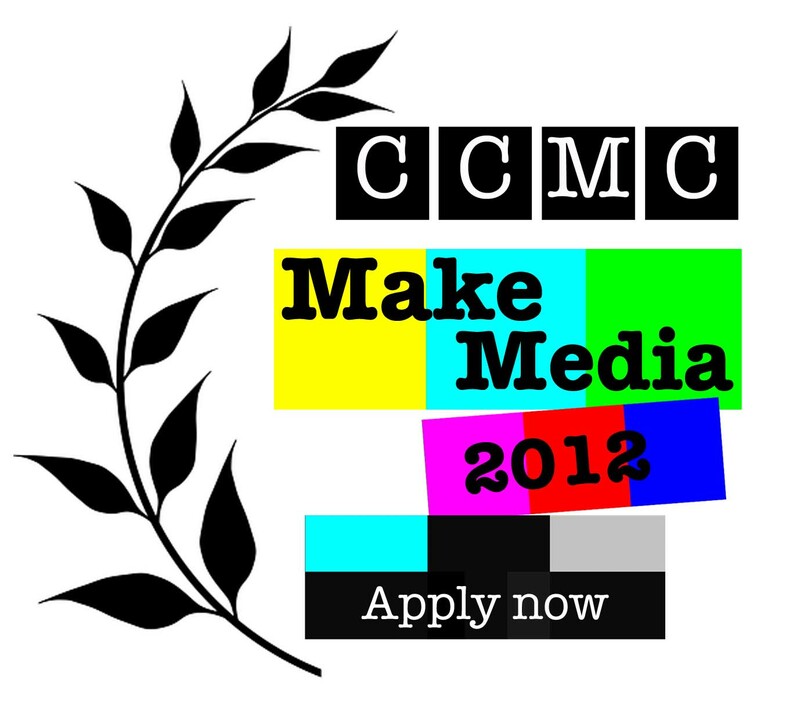 Make Media 2012 is open to filmmakers, production persons or skilled and experienced amateurs. Applicants are welcome to work in partnership with others but the total budget allocated for the production will have to cover those additional costs. CCMC will support the production and offer use of its equipment, as well as supporting translating the production into English, Greek and Turkish. For all of you that are interested you can read the full details and download an application form available on the CCMC website. Applications may be submitted in English, Greek or Turkish and the deadline for submission of the application forms is 21 September 2012. We are going to have a second round of applications announced later in the year as well. So start applying, and if you need any more information, you know where to find us! This article was first published on page 16-17 of The Cyprus Weekly (3 August). Yiouli Taki cuts a frustrated figure. As the coordinator for the NGO Initiative, an informal group of civil society representatives working towards reform of the legal framework for non-governmental organisations (NGOs), she has spent countless working hours organising meetings and drafting letters with the aim of achieving greater legal recognition of the sector. “This is as much about the process of reform as it is about the legislation”, says Taki, who doubles up as lead researcher at INDEX Research and Dialogue, a non-profit organisation working on issues of social policy. “Five years since this process started we do not know where we stand, and we are frustrated”, she adds. Back in November 2007 things were on the up. Civil society, a novel concept for a country which just three years previous had joined the European Union (EU) had been limited to – and dominated by – institutions such as trade unions, the Church and political parties. The concepts of volunteerism and philanthropy covered the range of activities promoted by these institutions as a way of giving back to society. Cyprus’ accession to the EU created new opportunities and incentives for participation of a new form of civil society which had been developing in Cyprus since the late 1990s that was neither politically motivated nor philanthropic in its outlook on issues of societal concern. Increasingly active at the European level through networking and partnerships, Cypriot NGOs have started becoming more assertive in their demands for participation in decision-making processes. In parallel, institutions of the state, the Planning Bureau in particular, started to see NGOs as potential implementing partners for policy both at home in abroad. European practice in the field of development cooperation – the delivery of financial support for countries in the developing ‘Global South’ – suggested that national agencies implement their policies in collaboration with local NGOs. CyprusAid, Cyprus’ development agency, has been implementing policy through ‘delegating’ funds through other EU member states such as Denmark and Ireland as well as through United Nations (UN) organisations like the World Food Programme. For collaboration to take place with local NGOs it was necessary for them to, amongst others, fulfil certain principles of financial transparency and accountability. Reform of the legal framework thus became a ‘wish’ for the Planning Bureau. “Not so much a wish, but also a need”, Taki responds. On the initiative of the Planning Bureau funding was secured from the United Nations Development Programme in Cyprus (UNDP-ACT) and a reform process was launched. In April 2008 a report assessing Cyprus’ legal and regulatory framework was published by the European Centre for Not-for-Profit Law. The report, available online, included a series of recommendations for the relevant Ministries of the Interior and Finance calling especially for the adoption of legislation which would set out a “Public Benefit Status” category for NGOs. The NGO Working Group – formed in June 2008 and later renamed the NGO Initiative – was an effort on behalf of civil society to participate effectively in the public consultation process expected to be launched by the respective Ministries. “We had requested in our correspondence from the very beginning that our positions are taken into consideration in a future bill, and that we would like for there to be a consultation in line with standards set by the Council of Europe”, said Taki. Things could be set to move before the end of the year. According to information obtained by the Cyprus Community Media Centre (CCMC) the Ministry of Finance’s work on all aspects of the legislation reform, including feedback received on relevant aspects handled by the Inland Revenue Department, was concluded in May this year. The new legislation package will be sent to the Law Office of the Republic of Cyprus for legal check once the summer period is over. From outside looking in, there is no reason why the appropriate legislative reforms cannot take place before the end of 2012. Inter-ministerial communication will be key for the bills to reach Parliament, and this is where the Planning Bureau could play its final role in the process. As the holder of the Presidency of the Council of the EU, a positive conclusion by December 2012 would be further indication of Cyprus’ European transition. We wish we could be there. On Wednesday 27 June the New Media Forum will be held in the Plenary Chamber of the European Parliament in Brussels. The event website is clear that this will definitely not be “yet another conference on the media”. It aims to offer “a unique forum to discuss opportunities and risks for media pluralism resulting from new media”, and share recent developments in the field, pulling together different strands of discussions that are currently taking place at EU level. – Does the new media contribute to, or undermine, a pluralistic public sphere? – Do new technologies overcome bottlenecks related to traditional media or do they create new information gatekeepers? – Should existing media ownership regulations for traditional media be relaxed, or extended to new media? – How have industries, such as music, books and film, faced the challenges presented by the new media? – Is there a need for diversity obligations on online on-demand media and can they be imposed? – Should the EU take an initiative in ownership regulation in this era of globalization? – How do we assess the role of publicly funded media, specifically public service broadcasters (PSBs), but also, where relevant, subsidised press and online operations? Community Media will be represented in these discussions, in the form of Pieter de Wit, President of the Community Media Forum Europe (CMFE) and Francesco Diasio, Regional Coordinator of AMARC Europe. We will be looking forward to their feedback as well as the Forum’s final report, and hopefully to contribute to follow-up discussions. 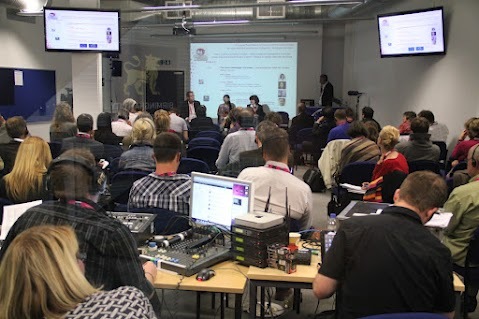 The Journalism & Media Ethics European Media Forum got underway in Birmingham, UK yesterday, with the participation of CCMC’s very own Larry Fergeson, called up as a member of the Board of the Community Media Forum Europe (CMFE). The Forum is part of the Council of Europe’s MARS – Media Against Racism in Sport programme, which aims at including non discrimination and the expression of diversity as an ongoing angle of media coverage, and encourage innovative production across different media. Back in January CCMC hosted the Cyprus National Media Encounter as part of the MARS programme, and we thoroughly enjoyed the experience and the active participation from local and international media professionals and civil society activists. Check out the Forum on Facebook, find out what’s on here, and follow proceedings online!